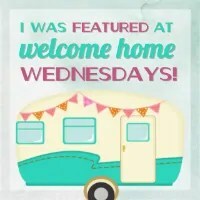 Welcome to Welcome Home Wednesdays #77!!! It’s been busy around here. Weekends seem to fly by with all the kid’s sports and activities. Between 12 basketball games and a dance competition last weekend, I’m still tired!! The month is flying by too. Is it already February? What? 8 Gals, 8 Blogs & 1 Great Party! Link up once to appear on 5 Amazing Blogs! Like any good hosts we’re sitting right by the present table waiting until our guests leave so we can go through the loot… the loot being your Welcome Home Wednesdays #77 links! We can’t wait to check out what you’ve left for us. Trust me there will be a lot of pinning, tweeting and facebook sharing going on in the near future… we can’t wait to show off what you’ve left! Hi Marilyn, hope you week is going well and you’ve been cooking up something YUMMY! Thanks for the party, Erin. Hope your week is great.